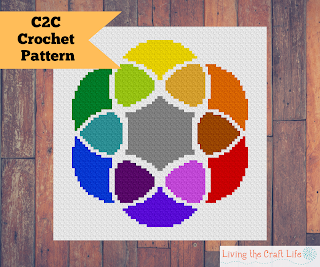 This design is my Rainbow Seed of Life C2C Blanket. 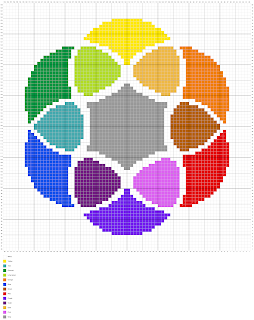 This uses the super cool motif of the Seed of Life, which involves the overlapping of circles to create new colors. How beautiful is that?! With this graph, you can make it in the colors listed, or exchange one for another. You could do a completely different color scheme and I'm sure it would look awesome! Gauge not essential, C2C Crochet a triangle 8 blocks high. If your triangle measures 5.5” tall, your project will end up being 53”x 53”. If you are interested in receiving written out row-by-row color counts for this blanket, I have a PDF version for sale that include right handed and left handed versions.